There’s a party going on outside Servicios de la Raza, a social services nonprofit in Denver less than a mile away from Mile High Stadium. Police block off a street to better accommodate the fiesta’s occasion: a Thanksgiving giveaway for the city’s poor. Four hundred or so families stream in for bags and boxes filled with food and clothes. Representatives from health provider Kaiser Permanente offer free flu shots and blood pressure tests; a DJ spins some hip-hop but mostly plays reggaetón and conjunto norteño, the polka-style music of northern Mexico. A large, colorful mural of the Aztec calendar high on the side of Servicio’s two-story building looms over the scene, along with the organization’s name in English: Services of the People. Executive Director Rudy Gonzales works the crowd. Sharp in a black suit, loafers and sunglasses, he tosses out jokes and words of encouragement in English, Spanish and enthusiastic Spanglish. “¡Buenos días, señora!” he tells a weathered, middle-aged Latina before shouting, “Hey man, what’s up?” to a friend. African-American and white families join in the festivities, but the majority of the crowd is Latino — mostly immigrants, according to Gonzales. More than a few are probably undocumented, but Gonzales doesn’t care. Servicios, which was started in 1972, has joined many similar, decades-old nonprofits across the West in a historical pivot to welcome new immigrants. For years, many of these groups, created at the height of the 1960s civil rights movement to help Chicanos — American citizens of Mexican descent whose families have deep roots in the United States — ignored and sometimes even actively opposed more recent immigrants from Latin America. Now they’ve begun to reach out, partly in fulfillment of their overall mission to help out those in need but also out of a desire for self-preservation. In an era when immigrant-rights groups and their concerns now dominate the progressive Latino agenda, it’s hard to remain relevant without the new outreach. Interviews with the heads of four Chicano nonprofits — Servicios, Utah Coalition of La Raza, the Phoenix-based Chicanos por la Causa and the SouthWest Organizing Project in Albuquerque — reveal another, deeper-rooted factor, however. They say escalating anti-immigrant sentiment across the Southwest over the past three decades, from state legislatures to the White House, endangers the social justice gains Mexican-Americans have made. To fight back is not just the right thing to do: It’s necessary. And to try and bridge the long-standing divide between Chicanos and Mexican immigrants — related groups but with different histories and needs — is now more important than ever. Servicios de La Raza executive director Rudy Gonzales is glad to serve anyone that comes to the organization's door, regardless of immigration status. GONZALES’ OFFICE COULD be out of a Hollywood screenplay for the executive of a busy, idealistic nonprofit. Trophies and stacks of documents form mountains around the edge of his desk; awards and Chicano art cover the walls. A couple of pictures feature Gonzales’ father — Rodolfo “Corky” Gonzales, a former featherweight boxer who went on to become one of the founding fathers of the Chicano movement through his group, Crusade for Justice. He brought an urban perspective to el movimiento, rallying people against police brutality and other inner-city issues. Corky also wrote an epic poem, “Yo Soy Joaquín/I am Joaquín,” which is still read in Chicano studies classes for its lyrical depiction of the internal identity struggles of people who claim both Mexican and American heritage. “We don’t get that as much here,” he says from behind his desk, while employees bring checks to sign or reports to review. “This is the land of Corky Gonzales. He’d tell us, ‘They’re your brothers and sisters. They’re not aliens.’ And people remember that.” Instead, he relies on private donors and foundation money to assist that population. Fortunately, the work has drawn almost no complaints from the Denver community. A founding father of the Chicano movement, Rodolfo "Corky" Gonzalez (right) at the National Convention of the Raza Unida Party in 1972. Before the late 1960s, however, that position was outside mainstream Mexican-American thought. Almost from the end of the 1848 Mexican-American War, many Mexicans who remained in the U.S. tried to align themselves with Anglos in order to survive. They married their daughters to white settlers, and minted new identities — as Tejanos, Californios, Hispanos — that emphasized the European side of their ancestry at the expense of their Indigenous side. That schism endured for decades, especially among groups created to fight Anglo discrimination and segregation against Mexican-Americans. A few Latino leaders, most notably labor organizers Bert Corona and Luisa Moreno, tried to soften this stance, but to no avail. Even the legendary Cesar Chavez notoriously lambasted migrant workers almost from the start of his career, regarding them as perpetual threats to his unionizing efforts. His United Farm Workers spearheaded an “Illegals Campaign” that asked UFW members to report undocumented immigrants to immigration authorities. Chavez’s cousin oversaw so-called “wet lines” in Arizona that monitored the U.S.-Mexico border — a Chicano predecessor to the far-right Minuteman Project militia of the mid-2000s. When other UFW members urged Chavez to tone down his anti-immigrant tactics, he refused to listen. By then, though, attitudes had begun to change. In the late 1960s, young activists began embracing the concept of Aztlán — the idea that the American Southwest was the historical homeland of the Aztecs, and hence that all people of Mexican descent were part of the same family, regardless of where the current border lay. This new generation —many of them children of the very “wetbacks” derided by the Mexican-American old guard — felt that the assimilation strategy of the civil rights movement during the 1950s had done little to improve their lives. They forged a new label — “Chicano” — to root them both in the U.S. and Mexico. Rudy Gonzales has fully embraced his father’s message. SB 1070 made failure to carry identification a felony. ROBERT “ARCHIE” ARCHULETA distinctly remembers his first encounter with la migra — immigration enforcement. His godparents, Mexican nationals, were repatriated during the 1930s when he was a child; a time when the Hoover administration forced over a million Mexicans, some of them American citizens, to return to their home country, putting them on trains or otherwise deporting them. His own family — whose roots in the American Southwest go back to the 16th century — soon fled Grand Junction, Colorado, for Pocatello, Idaho. He eventually moved to Utah during the 1950s to become an elementary school teacher. In the late 1960s, he co-founded of one of the first Mexican-American civil rights groups in the state, the Spanish-Speaking Organization for Community, Integrity, and Opportunity (SOCIO). Utah Coalition of La Raza President Richard Jaramillo helps his organization bridge the gap between the immigrant and Chicano communities. “Ten years ago, we were largely working with Chicanos,” says Utah Coalition of La Raza (UCLR) president Jaramillo, who was mentored by Archuleta. But “copycat laws” convinced UCLR to align itself with immigrants more than before. And the harsh words and anti-immigrant actions of President Donald Trump, Jaramillo maintains, were the final wake-up call Utah Chicanos needed. Under Jaramillo, UCLR started know-your-rights workshops and joined with other groups to offer undocumented people legal, medical and even housing assistance. He argues that this is in line with the historical Chicano movement, despite some pushback from older UCLR members. Ingrid Ordóñez Campos poses for a portrait in the South Valley Academy in Albuquerque, New Mexico, where she teaches a middle school special needs class. 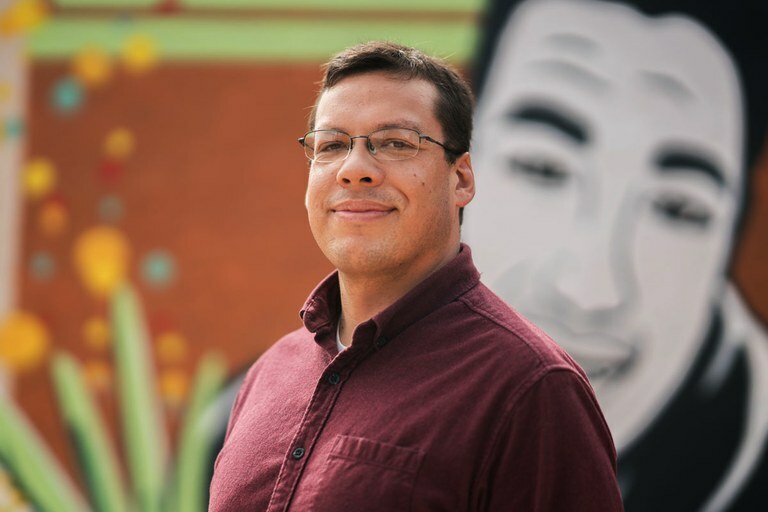 Ordóñez Campos is a Southwest Organizing Project board member, community organizer and DACA recipient. BRIDGING THE DIVIDE between Chicanos and Mexican immigrants has proved particularly vexing for the SouthWest Organizing Project (SWOP) in Albuquerque. Here in the West, New Mexico’s Mexican-American population has historically been the most adamant about keeping Mexican nationals at arm’s length. To this day, many Hispanos in the Land of Enchantment insist they’re descended from pureblooded Spaniards, or even conversos (Jews who hid their religion during the Spanish Inquisition) — anything but Mexicans. Residents even created a slur for them: surumatos. “Colonization is alive and well among us,” says SWOP executive director George Luján with a sigh. Everything is a bit messy in the SWOP offices on a Monday morning because “we had a lot of events over the weekend,” jokes Luján. But the atmosphere is positive as a multiracial wave of volunteers and workers stroll in a bit after 9. The group isn’t Chicano-focused, per se. It works to engage ordinary people with issues ranging from gentrification to the schools-to-prison pipeline via workshops, community forums, and lectures. It also has fostered partnerships with Native American groups, renting out storefront spaces near its headquarters in a working-class barrio of Albuquerque to a Native American comic book store and an incubator space. Luján officially started working for SWOP in 2008, though he’s known the organization his whole life. His father, Joaquín, was a member of the Black Berets, a militant group that looked to New Mexico’s own radical history of resistance for inspiration. They claimed as spiritual ancestors the Gorras Blancas, a Hispano secret society in the late 1800s that fought Anglo encroachment on their land grants and water rights — cutting down fences, ripping up railroad ties and setting fires to barns. That past, however, is not one that Mexican immigrants know about, let alone care for, Joaquín Luján believes. 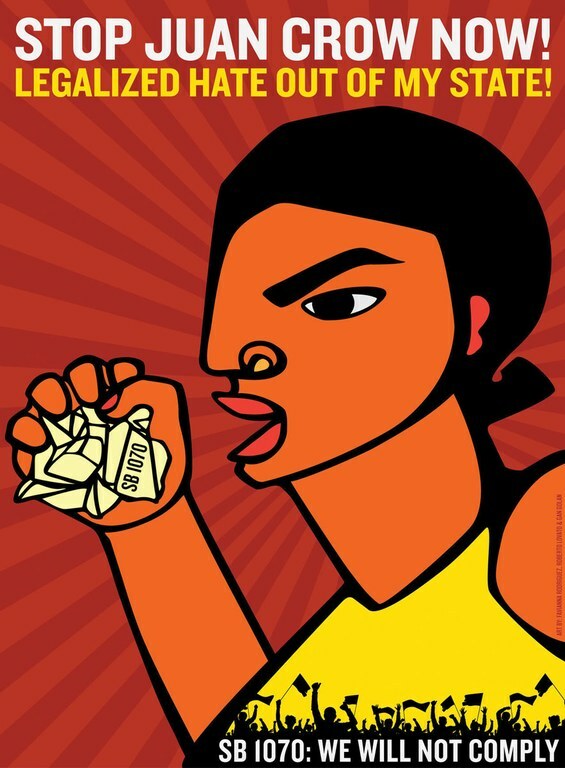 Founded in 1980, SWOP initially focused on environmental racism and voter registration drives while creating ties with similar movements across Latin America. But members realized they couldn’t ignore the tensions existed between Hispanos and newly arrived Mexican immigrants. They see it especially at community workshops, where SWOP tries to present issues it feels the two groups can rally around. “A Chicana once said, ‘We gotta stop them Mexicans from getting our welfare!’” Joaquín said with a laugh. “And then one time, an immigrant from Juarez told someone, ‘¿Que es Joaquín? ¿Que es él? Es como un gringo!’ (‘What is Joaquín? What is he? He’s like a gringo!’)” The woman evidently thought Joaquín Luján was a well-meaning but patronizing Anglo American. SWOP board member Ingrid Ordóñez Campos and fellow community activists discuss the script for an informational video on their “Education not Deportation” campaign. While SWOP works to unite adults, it especially focuses on high school and college students, encouraging them to see beyond a citizen-or-immigrant worldview. One particularly effective tool has been 500 Años del Pueblo Chicano/500 Years of Chicano History, a book edited by legendary Chicana educator Elizabeth “Betita” Martinez, which tells the saga of Mexican-Americans in the United States through archival photos and explanatory captions. The 1990 volume explicitly connected the struggles of Chicanos to Mexican immigrants. SWOP has sold 33,000 copies of 500 Años, and also turned it into a video and coloring book. The volume is consistently banned by school districts for its unapologetically Chicano approach or else stolen by students who want a copy for themselves. But more than a moneymaker, it represents an opening for SWOP. SWOP doesn’t try to take the lead on immigration issues in Albuquerque. Instead, it assumes peacekeeping during rallies and teaches other groups about their rights during protests. And SWOP has offered a lot of training as of late. Chicanos por la Causa President David Adame (checkered suit) cuts the ceremonial ribbon of a new Native Health Phoenix clinic at the CPLC Maryvale Community Service Center. CHICANOS POR LA CAUSA (CPLC) president David Adame calls the rapprochement between Chicanos and immigrants “el nuevo movimiento” — The New Movement. CPLC is unique among Chicano nonprofits in the United States in that it’s part of the political establishment. The group ended the 2017 fiscal year with revenue of $75.7 million, $72.4 million in expenses and $53.6 million in net assets that includes everything from health clinics to charter schools to even real estate across Arizona, New Mexico and Nevada. It started in 1969, with a grant by the Ford Foundation, a private entity that helped to fund many of the country’s oldest Chicano groups. CPLC’s founders were Arizona State students who had pushed for affirmative action at their university and organized walkouts at Phoenix high schools to protest the bleak learning conditions. But CPLC adjusted with the times, especially as border clampdowns in California and Texas in the early 1990s forced undocumented migrants to enter the United States through Arizona. The group opened a branch in Somerton to help migrants, which is still operating today. CPLC also took vocal stances in the last decade against the state’s increasingly vitriolic anti-immigrant actions. In 2006, voters passed Proposition 300, which forced undocumented college students to pay out-of-state tuition; in response, CPLC created the American Dream fund, which raised over $5 million for affected undergrads. The group became a plaintiff in one of many federal lawsuits against Arizona’s SB 1070. In the years since, CPLC has provided rent-free office space for immigrant-rights groups, helped to incubate new ones, sponsored events and hosted town halls. Nevertheless, some activists have complained that CPLC is too corporate and vendido (sell-out) because of its size and willingness to speak with politicians on both sides of the aisle. That’s now the de facto strategy for nearly all Chicano community groups and activists in the United States in the era of Trump. The plight of undocumented immigrants weighs heavily on la lucha — the struggle. Politicians are as likely to speak in their defense as are high school students. It’s as if they’ve absorbed the 1973 speech Corky Gonzales gave to urge Chicanos to realize that they and Mexican immigrants were one and the same. In 2008, Sonia Salazar, a UCSB student in Chicano Studies, joins over 1,000 people to commemorate the historic East LA student walkouts of 1968. Due to pressure from a new generation of leaders with a progressive pro-immigration stance, Chicano organizations have been pushed to expand their agenda. Gustavo Arellano is a features writer for the Los Angeles Times and the author of Taco USA: How Mexican Food Conquered America. Email HCN at [email protected] or submit a letter to the editor.